Authored by broulik on Apr 22 2018, 8:44 PM. 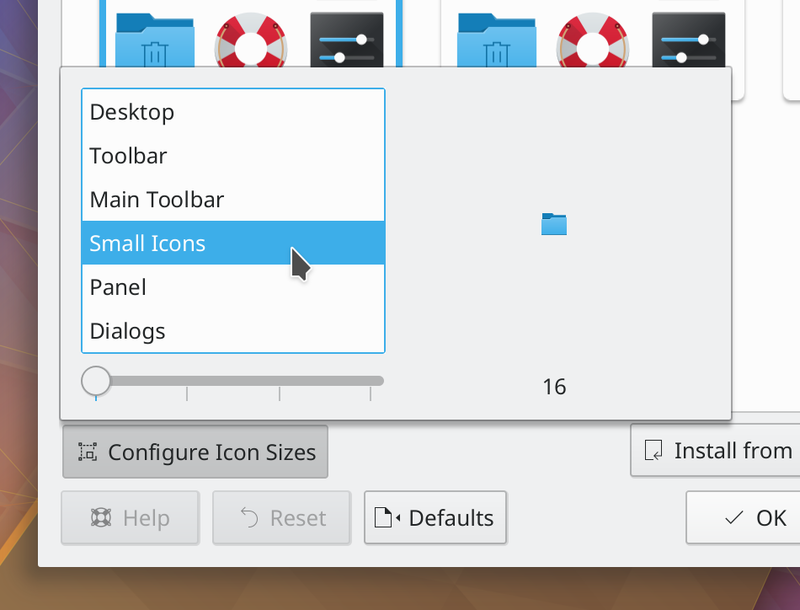 This completely drops the icon customization with icon effects and only retains the icon size settings. I also couldn't find any trace of that "animations enabled" check box it used to have. 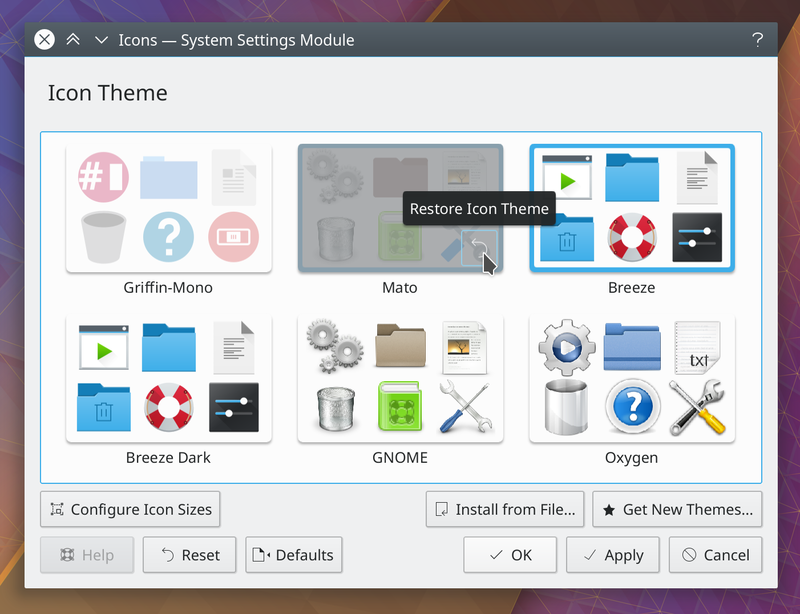 It adds drag and drop support for installing archives as themes. It can also download them from remote location when dropped from e.g. a browser. 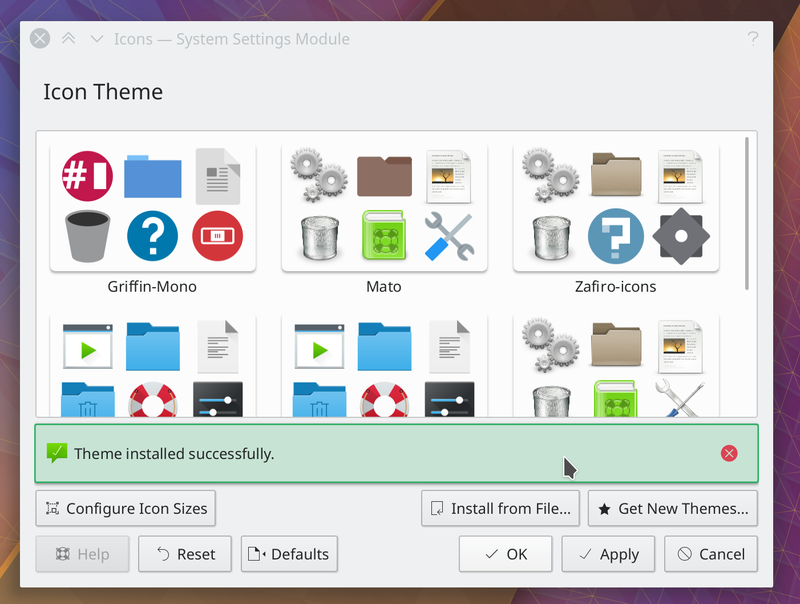 Installing theme files actually never worked in Plasma 5 as it got broken in the port from KIO NetAccess to storedGet. 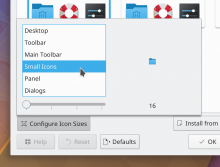 An animated preview is also added on hover showing a common selection of icons. 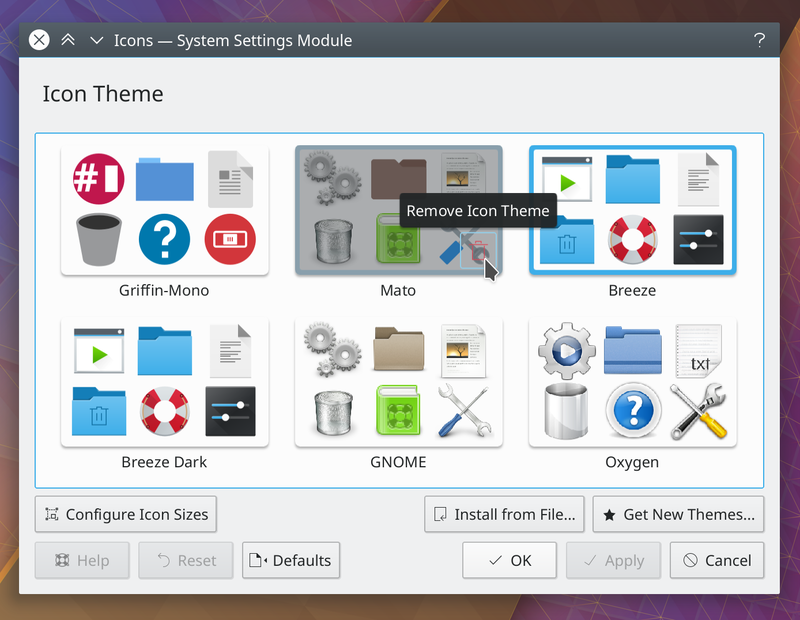 It comes with an undo feature and only if you hit Apply or OK it will acutally delete the themes, so you can undo individual or all (by using Revert button) deletions. If this is accepted, I'll look into rolling this out to the other KCMs that allow permanently deleting actual files. 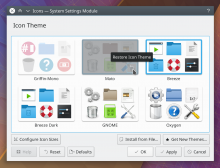 It is inspired by wallpaper settings. Oh my god, this looks so, so good. 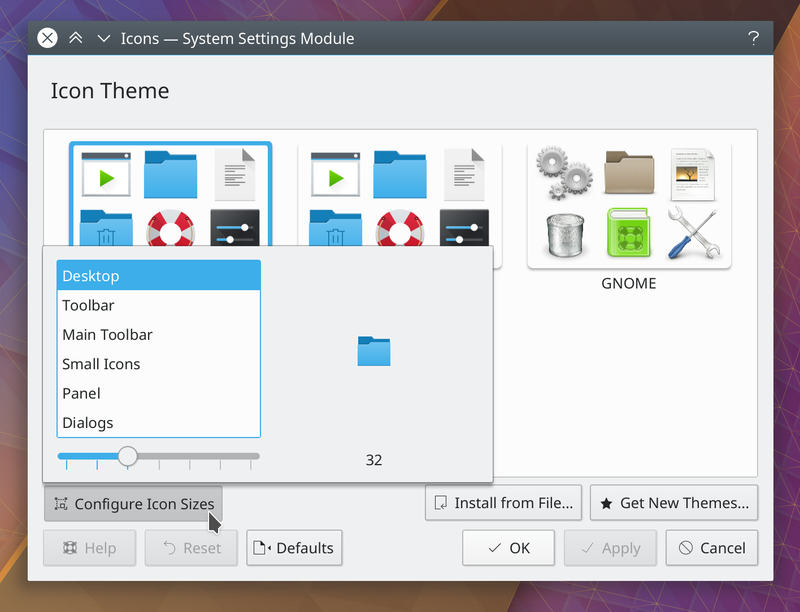 I love the icon size slider panel. Love it! 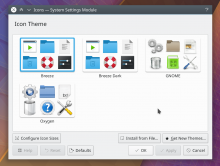 I like how convenient the configure button is. 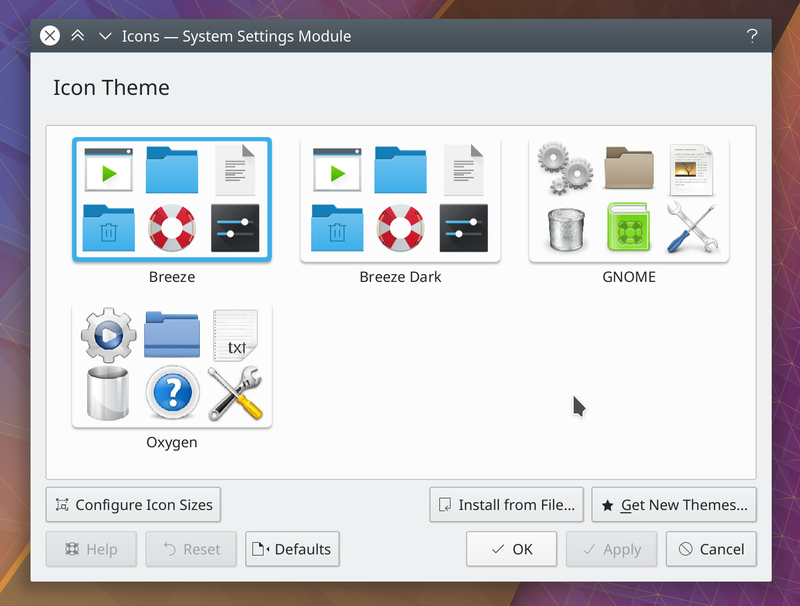 broulik retitled this revision from WIP: [Icon KCM] Port to new design to [Icon KCM] Port to new design. Delete button is not visible in the attached video at 0:14 (when you hover Breeze). Looks just like compression artefact in the screenshot. 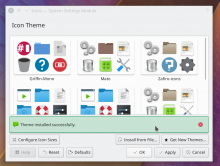 The theme cannot be uninstalled as it's system-wide and the thin lines seemed to throw it off. Otherwise it looks quite good. Do we have these strings somewhere in KIcon* so we don't need to duplicate them? DisplayRole is usually already defined, are you sure you need to duplicate it here? In Plasma models we usually use uppercase role names btw. 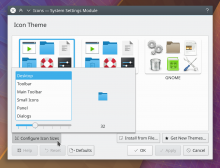 Is this legal in KDE code? Can we get rid of these copies too? I think it's trying to correct sizes being off by a fixed offset. But why is this necessary? What breaks if you remove this? This might not be a problem in 2018. This timer seems to be unused? @schwarzer I'm changing the catalog name to be more consistent with the other KCMs, is that an issue? There have been some discussions recently about catalog naming but I did not follem them. @lueck Do you have an opinion about this? Is this logic the right way around? The parent is valid for sub levels in a tree but this is a flat model so there will never be a parent as we only have a root layer.